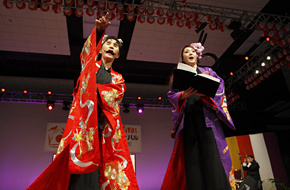 Man Nomura, who is a Kyogen performer of Izumi School of Kyogen and also recognized as a National Living Treasure of Japan conducted the Japanese performing arts called the”Daidengaku” to perform at the 15th Annual Honolulu Festival through the Agency for Cultural Affair of Japan. This was really a valuable opportunity for people around the world to see wonderful Japanese performing arts as well as the Japanese culture. — What is your comment on the performance of the Tenshu Monogatari and Daidengaku that you’ve watched at the venue? They were mediocre yet I felt that the culture and art are borderless. It’s like the soul of human beings are joining together and concentrating on the performance. I felt strongly about this, especially because I used to perform on stage as well. Furthermore, I was able to feel the energy and dynamism from the performance of the Daidengaku which their music was rhythmical. The Japanese people often wonder where can they listen to the Japanese language that is ‘beautiful’ and or ‘proper’. In this sense, the Tenshu Monogatari praises the beauty of the Japanese language. I would appreciate if the audience can capture this beauty through watching this play, rather than just focusing on the story and content. — Some of the local Japanese American elders were in tears as they were watching the performance. Do you think that is the reason? Yes, I think that the transparency of the language or its flawlessness went beyond the border and touched their hearts. — Then that means we can and should spread about the beauty of the Japanese language to the next generation in the foreign countries? Yes, I think that the Japanese language is gradually losing its beauty. However, the form of language that will be used on stage will be Old Japanese. Hence, it can be complicated but the Tenshu Monogatari goes beyond the complexity of the language. There used to be a wide range of vocabulary in Japanese language. For instance, when you are living under the same roof with different generations in your family, you can hear the young ones simply using the word “sad” to express their sadness. On the other hand, the older generation may use the word “miserable” instead. I would appreciate if the older generation can value their form of Japanese language to spread its beauty. — According to the actress Keiko Matsuzaka, the Daidengaku had encouraged many interactions among the local communities and families in Ito City, Shizuoka Prefecture as well as in Yamashiro Onsen, Ishikawa Prefecture. Also, she said that her daughter participated in the performance, which they were able to talk to each other about the things that they never talked before. That is true. Like I’ve explained previously, the Tenshu Monogatari is a play that’s very sensitive to words, whereas the Daidengaku portrays ‘human instinct’. I hope that these 2 performances can create more opportunities for cultural exchange. — The Daidengaku was popular during the Feudal Japan but it was later vanished. Why do you think your son Mannojo decided to revive it? We have emotions and the ability to overcome the obstacles in our daily lives, which can also be seen in the lives of the Japanese people during the Feudal Japan. I think that was what my son wanted to portray. It feels weird for me to say but I think the things such as performing arts and cultures can prosper our daily lives as well as our society, especially during the economic depression like today. I think they will be more valued in the future. 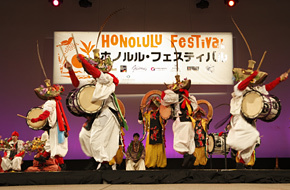 — One of the purposes of the Honolulu Festival is to spread your culture to people around the world including the next generation. What is your plan in order to spread the Japanese traditional culture of Kyogen as a Kyogen performer? This is little off topic but for instance, the next London Olympic is not just about the sports but also cultures. We are preparing for the Tokyo Olympics with an idea of “cultures and sports” which may be held in 2016 if possible. I digress, there are audience and a stage at our classical theater. As the time went on, the audience began to participate in the performance as if they are experiencing the culture through their own body. It wasn’t just about gaining cultural knowledge. Also, we don’t think during our performance because we are performing since we were little. Then, we can naturally express ourselves through our body by using our mind. I hope that the children of the future can experience such things. The “height” and “depth” are really crucial in traditional arts. I guess you can refer to them as ‘length’ and ‘breadth’. In other words, to popularize means to spread widely, which unfortunately the depth of arts may become little shallow. Therefore, it is important to understand our traditional arts or each one of our lives by considering its ‘length’ and ‘breadth’ or the “height” and “depth” as well as its ‘width’. I feel the same way about between countries. As I mentioned previously, the most important factor in spreading our traditional arts is “big family”. I don’t know the specific details but I think the people in Hawaii embrace the similar concept of familialism. If the culture becomes the nuclear family, it will be narrowed. — “Ohana” is the Hawaiian word for “family” which is frequently being used to embrace the bonding between family and people in Hawaii. To be honest, that word reminded me of the good old Japan, where you can feel the family’s warmth and generosity. There is a possibility that the Japanese spirit as well as the Japanese culture may become shallow as a result of Japan itself being the nuclear family. I think this is where the family can support each other. My parents were strict when I was growing up. Similarly, I think it is important to be strict and difficult as being a teacher of traditional arts. On the other hand, if the older generation such as your grandfather is present in your family, he may be more moderate by commenting such as “This is more interesting” or “This is more fun”. I feel that this kind of generosity is important. Of course, one can’t be praising simply by stating that it is interesting or fun. I realized that they are equivalently essential in teaching traditional arts as well as in fostering our daily lives. — The Izumi School of Kyogen has a long history of more than 300 years and its foundation is built on the concept of “big family” like the good old Japan. That is correct. It is difficult to pass down the tradition, if one didn’t think in a long-term perspective. We all want our beautiful flowers to be bloomed immediately which is difficult to achieve in one generation. Our roots are similar to weeds. No matter how many times you stomp on them, they wont die hoping that the beautiful flower may be bloomed. If unlucky, a beautiful flower can be rootless. The roots are essential because even if a flower dies, it can be bloomed again. Also, I think it is important for that kind of effort to ‘regrow’ needs to be reflected in various social levels beyond nations and ethnic groups. As of now, I would prefer to give a comment such as “That was fun” or “That was interesting”. I already said enough difficult and strict things so I think it is important for the elderly to be more understanding (laughs). The Master of the Izumi School Kyogen and also a Living National Treasure of Japan (Designated Important Intangible Cultural Asset of Japan).Born in Tokyo as the oldest son of sixth generation, Manzo Nomura. 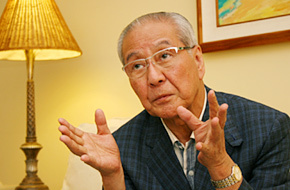 He had succeeded to the name Mannojo Nomura as the 4th generation in 1950. 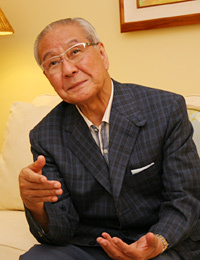 Also, he succeeded to the name Manzo Nomura as the 7th generation in 1993. 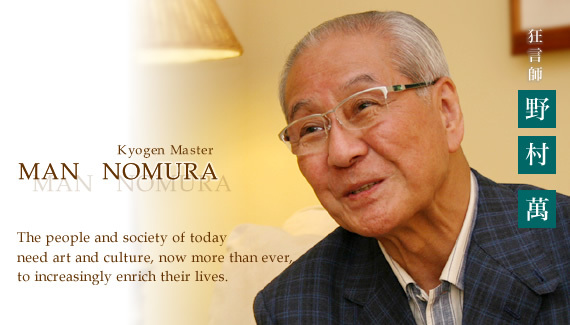 He became the first Man Nomura in 2000.Man Nomura is also the Board Chairman of Association for Japanese Noh Plays, President of Japan Council of Performers’ Organizations, Chairman of NPO ACT. JT. 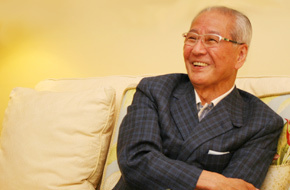 He is also involved in Japanese performing arts, cultural development and promotion.